Welcome to the music theory website at Iowa State University. We want you to thrive in music at ISU in all aspects—performance, academics and service. To succeed in at least the first two of these, you need to be fluent in the fundamentals of music prior to entering the degree program. 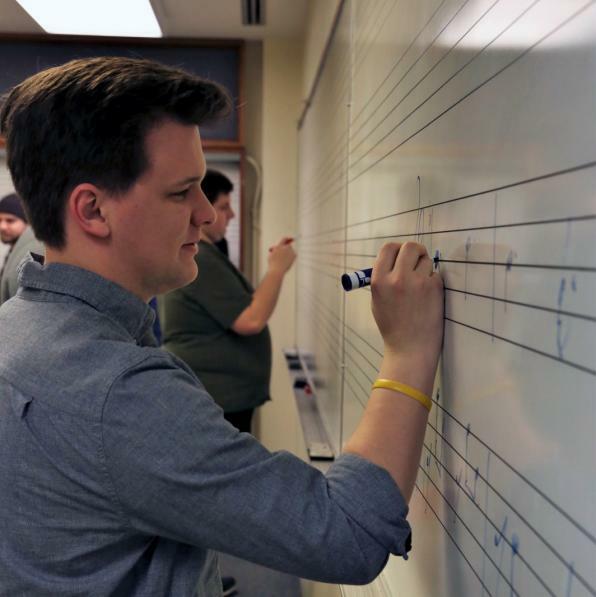 Because of this, the theory area at ISU requires all incoming music majors and minors to take the Fundamentals Placement Exam and/or the Advanced Placement Exam to assess your skill level. Notate and identify the basic duration symbols for notes and rests, from a 64th note up to a dotted whole note. Correctly use basic rhythmic symbols, such as dots, ties, and beams. Explain the difference between simple and compound time. Correctly state the number of beats in the measure and the value of the beat for any standard time signature. Correctly identify the time signature that best corresponds to a given measure of notated rhythm. Pitches in bass, treble, alto and tenor clefs. Key signatures in bass, treble, alto and tenor clefs. Major scales and the three forms of minor scales starting on any given pitch. Intervals and their inversions up to the size of a perfect 12th. For students coming to Freshman orientation, the placement test is already scheduled into day two. Sunday August 25, 2019, from 11:30 am to 1pm in Music Hall, Room 24. Sunday, August 25, 2019 from 11:30am-1:30pm in Music Hall, Room 24. Be sure to sign up for your ensemble auditions, (orchestra, jazz, choir) at times that do not conflict with the theory placement tests as they are only given once. Any student wishing to take MUS224/225 in the fall semester must first take the Fundamentals Placement Exam. Your placement into our core theory courses is dependent upon the successful completion of this exam. The exam will last approximately one hour or less. Students who do not pass this exam will be placed in MUS101 and will be behind by one year in the core theory courses. Click on the links below to access example exams with problems similar to those found on the Fundamentals Placement Exam. Click on the links below to access the answers to the sample Fundamentals Exams. The Advanced Placement exam is required of all transfer students and students with an AP theory score of 4 or 5. This placement exam evaluates knowledge and skill of four-part writing, voice-leading principles and techniques, Roman numeral analysis, figured bass realization, cadences and non-chord tones. Following the exam a recommendation will be made about where to best begin in the theory sequence at ISU. Click here to access an example exam with problems similar to those found on the Advanced Placement Exam. Click here to access answers to the Advanced Placement example exam. All incoming music major and minors must take the Fundamentals Placement exam. All transfer students and students with high school AP credit in Music Theory must take our Advanced Placement exam. What if I don't know any music theory yet? You have plenty of time to get prepared. Ask for help from a music teacher, whether it be your band director, orchestra director, choir director, or a private teacher. Be sure to check out the learning resources given above. What if I don't pass the Fundamentals Placement Exam? You will have to take MUS101 in the fall and be behind by one year in the core theory program. What if I already know basic music theory? Great! You are well prepared to succeed as a musician; however, you must still take the Fundamentals Exam. Does Iowa State University grant credit for the Advanced Placement (AP) exam in music theory? Iowa State University grants credit for a score of 4 or 5 for the high school AP test and students are typically placed in our second semester theory course, MUS234. However, these students will still be required to take our written Advanced Placement exam and to demonstrate their sight singing skills. If you have any further questions, please contact Dr. Kris Bryden at kabryden@iastate.edu or Dr. Julie Sturm at jksturm@iastate.edu.